I have searched the forums but did not find anything that deals with Hungarian armor, so I decided I will create this topic for anyone who would like to learn about the short self-made tank history of this small, but important European country during the second World War. 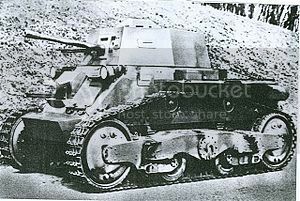 This light tank (or as they called it at the time: small tank) was the very first Hungarian designed and developed armored vehicle. The first prototype was made in 1936 in the Weiss Manfréd factory, marked the V-3. In August of 1936 the tank undertook a swimming test, which was possible thanks to the various swimming equipment and fans installed to the sides of the vehicle. After the tests in Hungary, the engineers installed a bigger engine in the prototype and transported it to Great Britain, where it took several more tests. Eventually the V-3 got an even stronger Alvis engine, but it never entered mass production. The improved version of the V-3, the V-4 was the first Hungarian built tank that entered service. The engineers have fixed the problems with the suspension and with the stronger engine, the V-4 reached acceptable speeds. The prototype was made in March, 1937, and by the end of the summer, the tank got a 40 mm cannon and the turret has been expanded for the twin machine gun and the fourth crewmen, the tank commander. It entered service in the end of 1937, but by the time it could have been mass produced in useful numbers, the works on the 38M Toldi and the Turán medium tank were already underway, and the V-4 was considered outdated. The Nimród was based on the Swedish L-62, but it had a longer chassis, because the Hungarian engineers added an extra set of wheels. The turret had been redesigned, but the armament was untouched. On the second production batch the engineers have replaced the German Büssing engine with a Hungarian GANZ engine. It entered service in 1940. The Nimród was designed to fulfill two roles originally: an effective tank destroyer and an anti-arcraft gun. During the battles fought in the Soviet Union, the Hungarian Army realized that the Nimród was ineffective against the Soviet T-34s and KV-1s, but the tank turned out to be an excellent self-propelled gun against enemy aircrafts, supporting infantry and armored units. Because of this, between 1943-44, they reassigned the Nimród from armored forces to AA artillery units. This tank entered service in 1938, and was the modified version of the Swedish L-60, produced by MÁVAG and Ganz. This light tank with inadequate weaponry and armor was used for reconnaisance and observation. The Toldi Is were deemed inaequately armored and underarmed. Since there was no reason to completely rebuild the design, the engineers in 1942 decided to simply fortify the vehicle. Because of the weakness of the tracks, the hull got reinforced only at the most critical spots, however that was still not up to standards. To increase firepower, the Toldi IIa got a 40 mm cannon. The tank’s weight increased, thus failures with the tracks became more common; its performance records were not high, so it was used mainly for scouting. Hungary bought the license for this tank from the Skoda manufacturing plant in 1940. The base was the T-21 Czechoslovakian tank, which was still in experimental phase. The engineers heavily modified the T-21, and the result entered service as the Turán. A prototype was made in 1941, its manufacturing took place in several different industrial plants. The crew considered it hard to handle, and the thickness of the armor was insufficient as well. Its redesigning was necessary to increase protection and firepower. The redesigning of the Turán was inevitable by 1941. The Hungarian Army wanted a version with greater firepower and better protection. They solved this problem by adding a bigger gun and a bigger turret. This modification increased the tank’s weight by one ton. The heavier weight resulted in worse performance records and the engineers realized that they need a long barreled gun instead of a short one, but that version - and the Turán III - did not enter mass production. The development of the 43M 75 mm long-barreled tank brought hope for the Hungarians, but only two of these were ever made because of manufacturing problems. These two were made in the spring of 1943. The thickness of the frontal armor increased to 80 mm and in several spots the armor was spaced. The improved gun and the heavier armor however, resulted in worse maneuverability. The engine’s performance stayed the same although the vehicle’s mass reached 21 tons. The planned reconstruction of the Turán Is to the T. III version never became reality. The bombing of the Weiss Manfréd manufacturing plant in July and August of 1944 further worsened the situation. 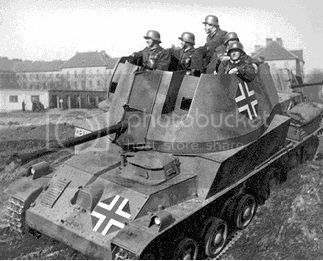 From the experiences of the germans, the leaders of the Hungarian Army decided that, to support the infantry and armored units and to effectively counter the enemy tanks, Hungary needs a newly designed self-propelled gun. The chassis came from the Turán tanks, but it got widened by 44 cm. 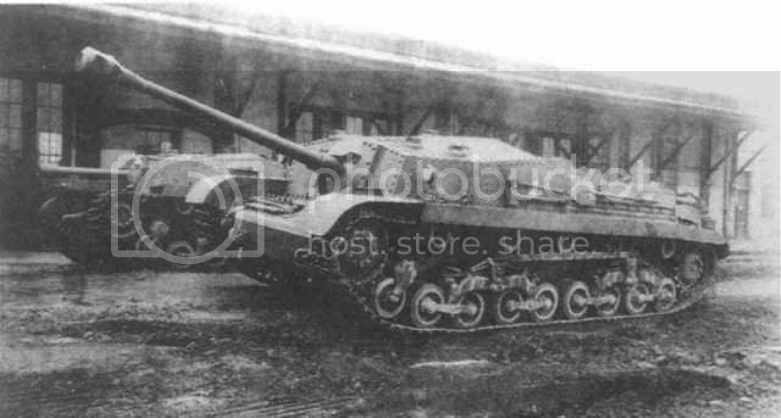 They planned two variants for this chassis, but because of the production failures of the 75 mm cannon, the tank destroyer version called Zrínyi I never entered mass production. The Zrínyi II, equipped with a 105 mm Howitzer, was not capable of effectively fighting enemy tanks. There were problems with the transmission system and the use of divided ammunition resulted in low firing rate. However, the acceleration, maneuverability improved significantly, and it had a low profile. The prototype was made in 1942, and the Zrínyi II entered service in the next year. 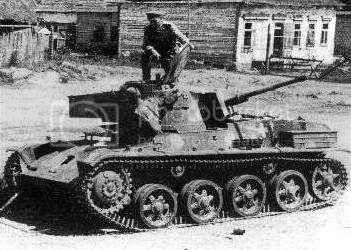 The Zrínyi I was designed to be an assault gun, equipped with the Panther I’s 75 mm, long-barreled cannon. The frontal armor was 100 mm thick. The Ganz factory announced that they can’t make the 75 mm guns because of lack of material, thus only the prototype of the Zrínyi I was made. The Tas’s weight was planned to be 38 tons, but only the Turán’s engine was available, a new engine could not be bought nor made at the time. To solve this issue, the engineers used two Weisz V8 engines, with a 2x5 transmission system. The tank was supposed to have front wheel drive, following the system of the Tiger and Panther tanks. When developing the suspension system, they have used the earlier experiences with the Turán and Toldi tanks and did not equip the vehicle with torsion bars and they quit using the small wheels. Instead, the engineers used medium sized wheels, which were supported by three leaf springs per side. They have solved a greater issue as well when they started to weld the armor platings together and they used only a minimal amount of rivets. 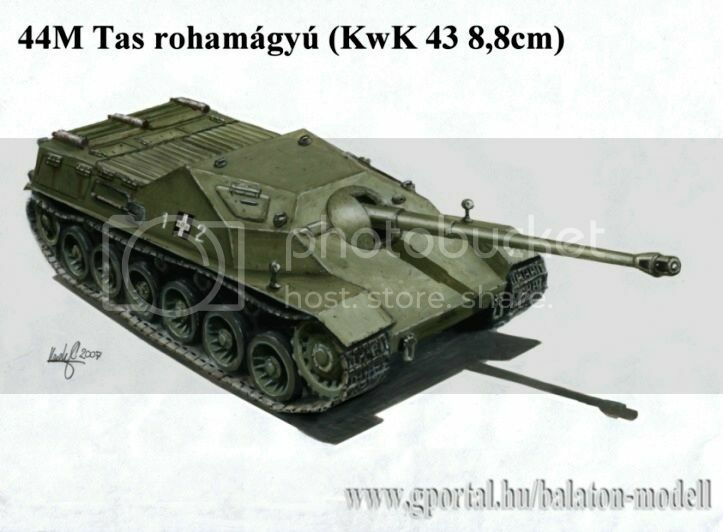 The plans for the Tas heavy tank included a 75 mm 43M hungarian armor piercing gun, so they wanted to make the smallest turret achievable. During the spring of 1944, the welded chassis and turret was made and the suspension, the engines and the transmission were inserted. On July 27, 1944, the work on the Tas tank had to be suspended because of the American bombing runs. The bombings destroyed the assembly area and the manufacturing line. The assembly shop collapsed on the prototype, which burned out under the ruins. The engineers at the Weiss Manfréd factory planned the assault gun design as well. The suspension was the same as the heavy tank’s and they used the Zrínyi I’s low profile measurements. They wanted the two engines to be operable both together and individually. The 2x5 transmission and the front wheel drive was also planned to be used in this vehicle. The main armament would have been the German 88 mm L/71 gun, and the 120 mm thick frontal armor would have been angled 40 degrees. The engineers could not finish the assault gun because of the bombings in 1944, but they made the parts that were common with the heavy tank variant. 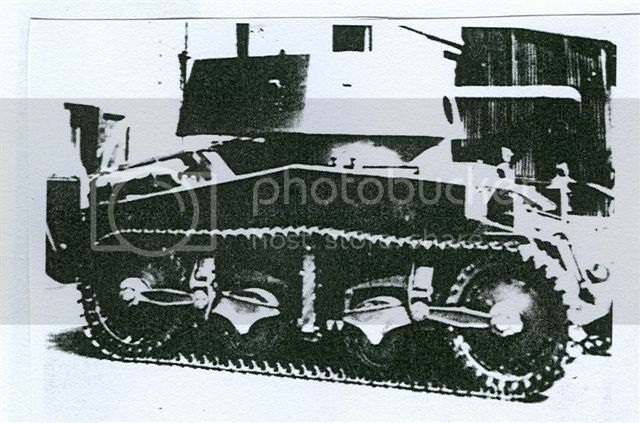 Both the heavy tank and the assault gun version would have had two prototypes, so the workers made 4 sets of suspension, engine and transmission parts. And basically that's it. Hope you guys liked it! Edited by Mieter, Feb 08 2013 - 03:58. Cool post! You took the time to show some interesting tanks of Hungary, nice! Super cool. No arty? Can never have too many tanks. 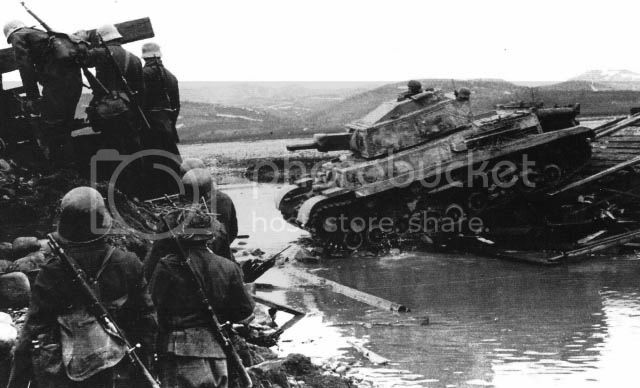 I didn't know Hungary had such awesome tanks/tank designs in World War 2. "Hans, Fritz, and a couple of the the boys take a break in the new deployable field hot tub on the way to the line of departure." That last one, the 8.8cm L/71 TD....that design is just awesome looking. Functionally seems similar to the Jagdpanther. The 44M TAS also seems a lot like the Czech design, the Skoda T25. Similar weight, gun caliber, general layout, etc. Thank You, Sion! I have updated the OP with the Straussler V-3 and V-4, and also corrected some typos. Mugsy? General_Direction? Pleeeease? Well, I have the right to dream, yes? Edited by Mieter, Feb 08 2013 - 04:04. Hungary will likely be combined with Sweden, Poland, Italy, Czechoslovakia, Romania, Switzerland, etc. in a Pan-European Tech Tree. That would be cool as well. There use to be a Hungarian tank thread, but I think it was archived. Anyway, those Hungarian TDs look pretty formidable. Edited by rivit, Feb 08 2013 - 15:15. Well, a search usually brings up archived topics as well, but it didn't find anything relevant. I was trying to see if an austro-hungarian full tech tree could be made, but I only found 1 light tank marked as purely Austrian. What's up with that country? So do I, although I would want to see them BEFORE the Japanese or the Italian tree. Actually, before everything else. If WG implement them as the most expensive premium tanks, I would still play them. Especially the 44M Tas. 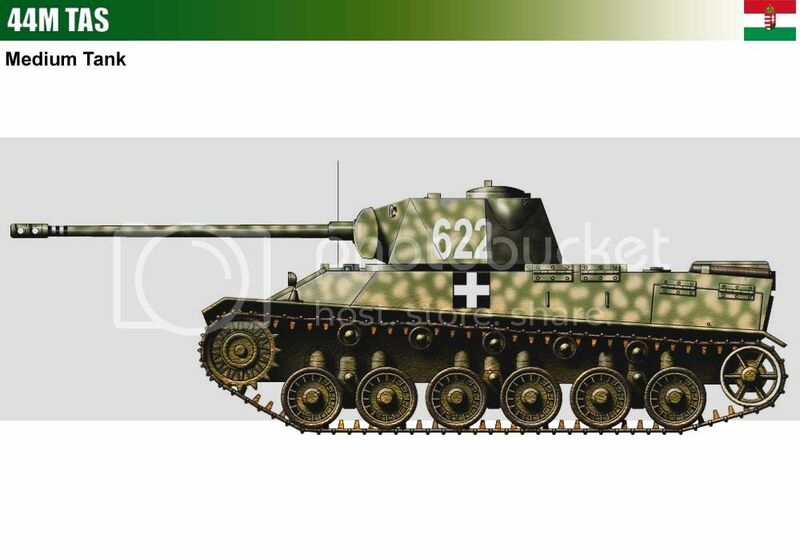 It could be an excellent Tier 7 medium, a close combat brawler version of the Panther, perhaps.